Handmade sai made of solid stainless steel No 304 (NOT CHROME) with long lathe turning (not casted). Chrome usually reffers to chromium plating, which is a technique whereby a layer of chromium is electroplated onto the outside of a metal object. The disadvantage of this technique is that Sais are prone to chipping, flaking and peeling due to hits and finally corrosion and rust. On the other hand, Stainless steel (inox) is valued for its anti-corrosion properties and its high resistance to rust. Stainless steel Sais stay unaltered for many years. Since there is no coating, we don't see any effects such as chipping, flaking and peeling. Metal can be round OR polygonal. 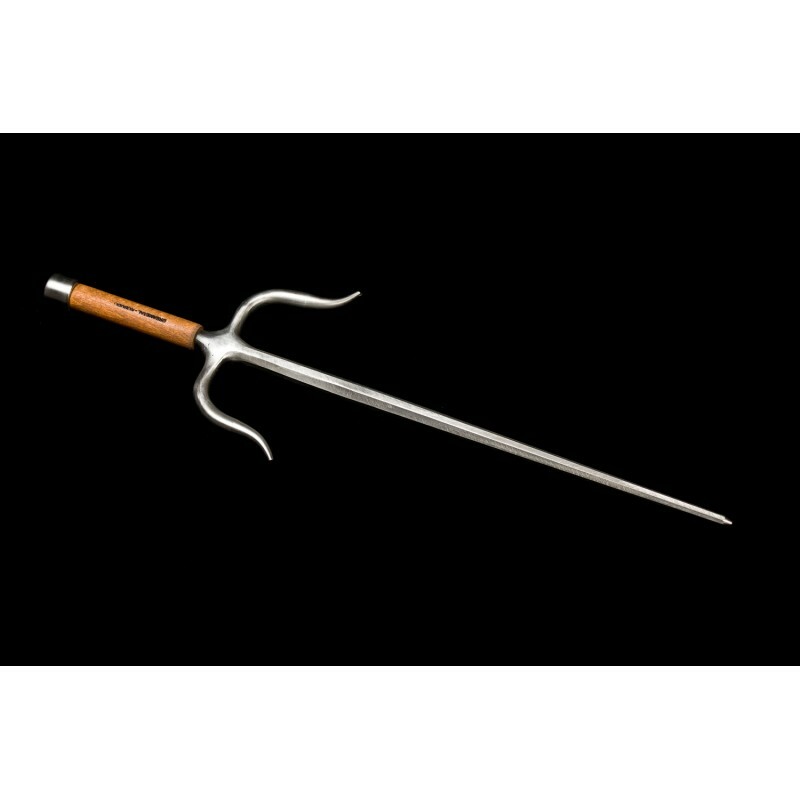 If you wish to have the option to change tsuka gashira of Dreametal Kobudo Sai, you much inform us upon ordering your sai, so that tsuka gashira of your sais is able to unscrew. If this notice is not placed ahead ordering, tsuka gashira of your sais will not be able to be replaced. The sai is a three-pronged truncheon sometimes mistakenly believed to be a variation on a tool used to create furrows in the ground. This is highly unlikely as metal on Okinawa was in short supply at this time and a stick would have served this purpose more satisfactorily for a poor commoner, or Heimin. The sai appears similar to a short sword, but is not bladed and the end is traditionally blunt. The weapon is metal and of the truncheon class with its length dependent upon the forearm of the user. The two shorter prongs on either side of the main shaft are used for trapping (and sometimes breaking) other weapons such as a sword or bo. A third sai was often carried behind the back in the belt sash (obi) as a replacement for a hand-held sai that was thrown at an opponent. Sai techniques closely resemble those of karate, and its use develops strong wrists and forearms.